Many Civilization players fall into one of two camps, with the rest generally somewhere in between. In one you have the players who want to build large and glorious civilizations and would rather not have to deal with issues such as wars that detract them from their building. In the other you have those who enjoy expanding their empires at the end of a sharp pointed stick. While the name of the Civilization IV Warlords expansion certainly indicates that it is geared towards the latter group, there is something for everyone in this expansion. Probably the first question that comes to Civilization fans’ minds when they hear of a new expansion is “what are the new civs?” Well to answer that question Warlords adds six of them to the game: the Carthaginians, the Celts, the Koreans, the Ottomans, the Vikings, and the Zulus. Of course each comes with its own unique units and leaders, and in keeping with the expansion’s theme the new civs are slanted towards those with a historical knack for making war. 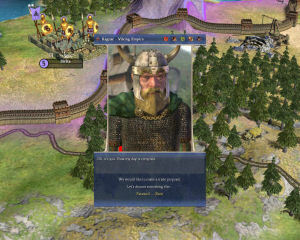 The expansion introduces the warlord unit to Civilization IV which is a great general to join the other “great” people that your civilization produces now and then. The warlord can bestow bonuses on the military unit it is attached to, such as increased experience or a stat boost. Warlords can also be sacrificed in a city to create an academy to boost the production and quality of military units created in that city. Although they have an impressive sounding name, warlord units will not be able to run amok across your enemies in the game. They simply add a little bonus to a stack of military units and are as susceptible to attack and defeat as any other unit. Those of you who are more civic-minded players will be happy to hear that three new wonders have been added to the game, although they are all confined to the early stages of the game. The new wonders include the Temple of Artemis, Great Wall, and University of Sankore. The Temple of Artemis is basically an empire-wide temple, the Great Wall will ease your barbarian troubles, and the University of Sankore will turn your religious buildings into research centers as well.